Luke Cole scored a treble as Racing Club Warwick maintained their impressive league form. Racing Club Warwick continued their recent good league form with three points and another clean sheet at Rocester. Following two 5-0 home league wins, Racing travelled north with new signing Jak Jeys starting alongside Ben Mackey and Wade Malley. Joe Smith partnered the returning Scott Turner in the heart of the defence with Sean Castleton and Jamie Tank unavailable. Warwick scored early on when a Wade Malley run and cross was poorly dealt with and the clearance fell to Luke Cole who smashed the ball into the roof of the net from 20 yards. Jeys was causing havoc on the right-hand flank and a fine turn and run drew a good save from the keeper before a thunderbolt drive was headed off the line. Mackey then turned well and found himself one on one with the keeper who produce another good stop with his legs. 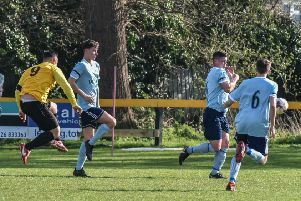 Warwick remained in control but for all the good midfield play, particularly from Henry Leaver and Alex Price, it took until the 71st minute to put the game out of Rocester’s reach. A fabulous deep curling cross from Jeys was met at the far post by Cole who nodded home. The two-goal cushion relaxed the visitors who completed the scoring in the 80th minute, again through cole. The midfielder completed the perfect hat-trick after his right-foot strike and header, smashing home a left-footed piledriver to deservedly carry off the man-of-the-match award. Meanwhile, Racing Club boss Scott Easterlow is building up for his side’s biggest game of the season on Saturday, with unbeaten Heather St Johns the visitors. “If we can be successful it will represent a terrific start for us,” said Easterlow who confirmed he is still looking to strengthen his squad. “Heather represent a very good side and a tough game for us. “Some of the players they have managed to add in recent weeks to what they already had in their ranks shows the club are backing the manager. “We are at home, though, and you have to have a good home record if you want to be successful, so we back ourselves and know on our day we can beat anyone in this league at home.